168-minute double DVD by Bridget Woods. Life Drawing Techniques in Action by Bridget Woods is an inspiring film, which explains how to draw both the female and male form in different poses. Exercises guide you through various techniques for achieving good proportions, line quality and sculptural tone while developing the trust between your brain and eye. With these techniques in hand, a more creative approach is explored, enabling marks to reflect feelings and expression. Bridget Woods is an internationally acclaimed artist and a widely respected teacher. In this double DVD, you can see her work recreating the models on paper and explaining the processes throughout. DVD One: Rhythm and Curve, Measuring and Angle-finding, Negative shapes, Zig-zagging, Eye-trust, Passionate line. DVD Two: Tone: a trip around the model, Mid-tones, Find the Form, Black and White on Medium. Bridget Woods regularly exhibits at Open Doors (now Chichester Art Trail). Bridget’s main aim, stimulated by the spirit of subjects ranging from weather, landscape and people to still-life and abstract images, is to convey feeling and atmosphere through the unique ‘alchemy’ of transparent watercolour. Dedicated to sharing her enthusiasm and love of these subjects, Bridget has been teaching for since 1979 and has led many courses in Britain, Iceland, Madeira and France. Her second book ‘Painting Expressive Watercolour’ was released in 2014 by The Crowood Press. She teaches at West Dean and Tidy Street Studio and tutors privately by invitation. Bridget is committed to enabling students to express themselves rather than a ‘generic style’ by exploring their viewpoint and expanding their mark-making vocabulary. 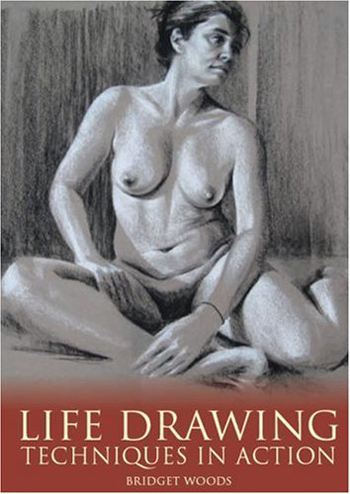 Her first book ‘Life Drawing – a journey to self-expression’ is used by both life drawing tutors and students, as is her companion double DVD ‘Life Drawing – Techniques in Action’ (published by The Crowood Press in 2003 and 2007 respectively). She has written eight articles for ‘The Artist’ magazine. In 2007, Bridget explored and painted her responses to geologically comparative areas of England. She has written a practical book on Expressive Watercolour Painting to be published in 2014, also by The Crowood Press. Click on the underlined link to go to the current offers on the DVD Life Drawing Techniques in Action on the Jackson’s Art Supplies website. The image at the top of the article is a drawing by Briget Woods from the book Life Drawing: A Journey To Self-Expression.